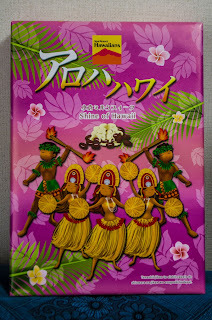 More sweets with Japanese-Hawaiian taste. In Japanese it says “Aloha Hawaii” (better play it safe) and “sweets with ogura and milk” with “ogura” (小倉) being a red-bean paste. In English it doesn’t say anything since it isn’t English but Japanese written in the Roman alphabet –I’m not sure who is supposed to read this.